The Alton Scholar Bowl Team celebrated its win at the District Tournament in Bakersfield on Saturday, April 16, 2016. Alton defeated Gainesville in the final match - 320 to 280 - in a 'come-from-behind' victory. They will advance to the Sectional Tournament which will be held in Fordland on April 27th. 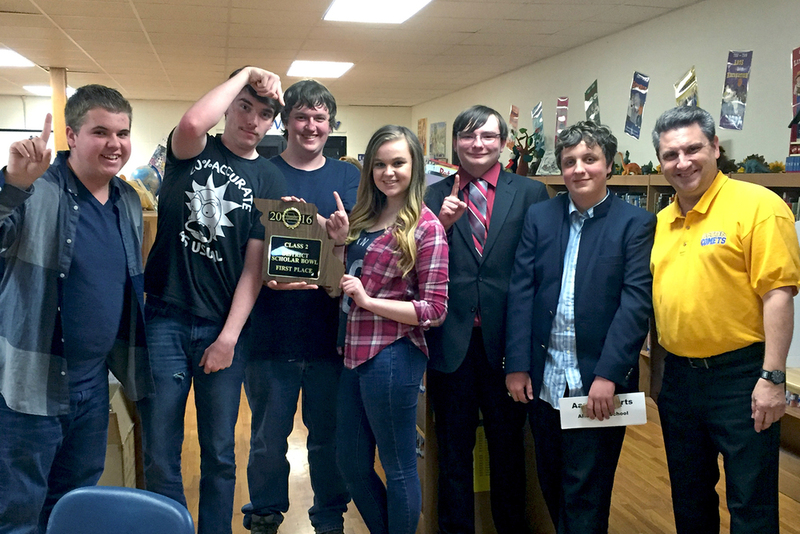 Pictured are (from left to right), Ethan Granger Joe Graves, Caleb Buffington, Amber Barton, Paul Walker Hall, Aaron Roberts and Robert Kreutzer (coach). The Alton team had a winning season record of 16 and 7. The team also won the Big Springs Conference Tournament.